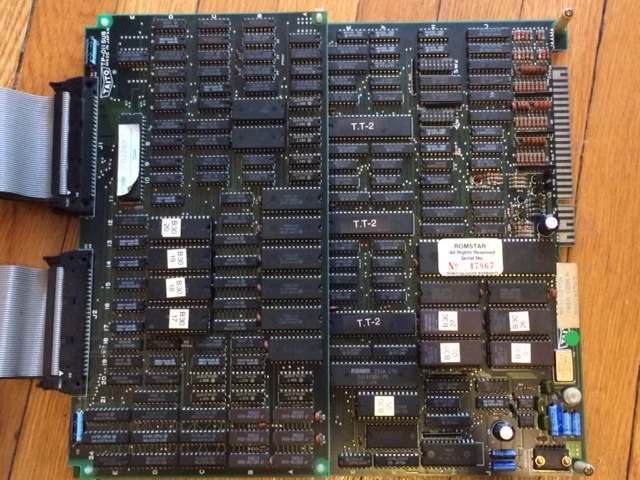 Recently, I picked up an ‘untested’ Twin Cobra PCB off of eBay. As most of us are aware, when something is advertised as ‘untested’, 9 times out of 10 its completely broken. This Twin Cobra was no exception to this rule. Out of the box, the game booted up to a flat black screen, zero activity at all. When I see this on unknown condition boards, the first thing I do is give it a thorough visual inspection. I generally look for rust/corrosion, deep scrapes and gouges severing traces, physically damaged capacitors and IC’s, etc. Right off the bat, I noticed the the Koyo 28mhz crystal at X1 was hanging on by a thread! The other three had snapped off at the base of the crystal, so it was time to find a replacement. I was able to find a donor crystal in my parts boards. 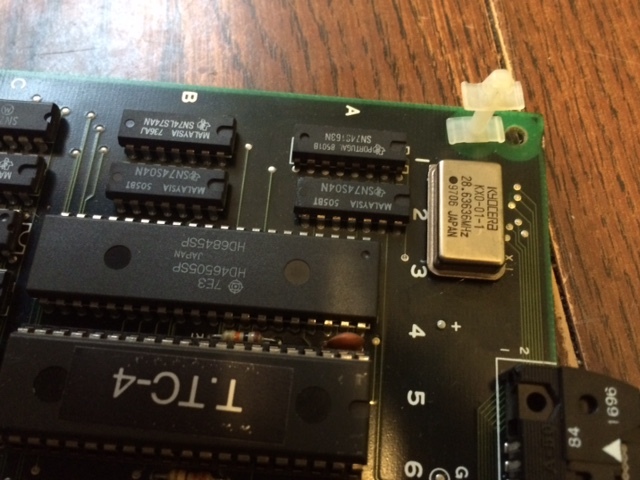 I desoldered what was left of the original crystal, and then I installed the donor. The donor is slightly faster than the original, but it should be OK until a proper replacement arrives in the mail. The rest of the board looked good – no gouges, no other damage so to speak. At this point when I powered it up, the game sprang to life! 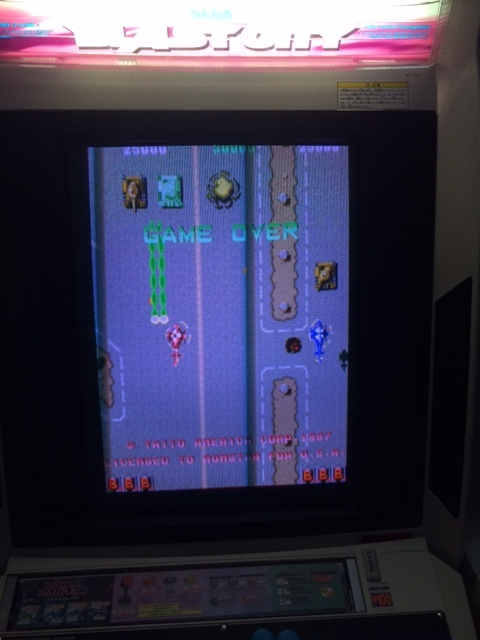 Everything appeared to be working as expected, so I coined up and tried a game. Almost instantly, the next fault presented itself. Some (not all) of the sprite layers were incorrect. When the tanks aimed at towards 7:00, their turret would disappear completely. When larger tanks were destroyed, their remnants would take priority over my helicopter. I knew something was at fault either with the ram or layer priority sections of the video board. 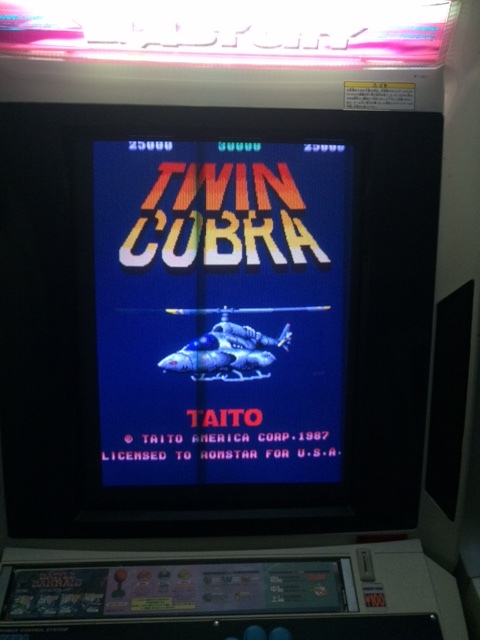 From here, I started reading up on the mame driver, as well as the memory map for Twin Cobra posted on Toaplan.org. From what I could tell, it looks like sprite priority is controlled by the bipolar roms present on the TP-011 SUB (graphics) pcb. 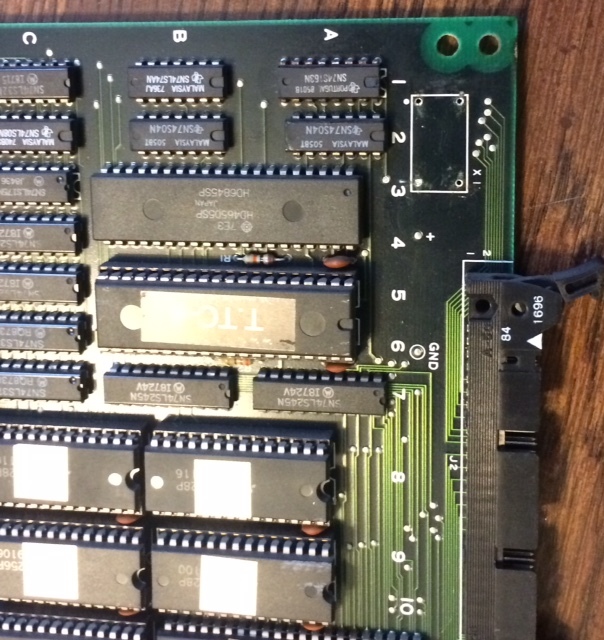 I gave the 82S123’s a closer look, the bipolar rom marked B30-22 on the parts side of the PCB had a factory defect! 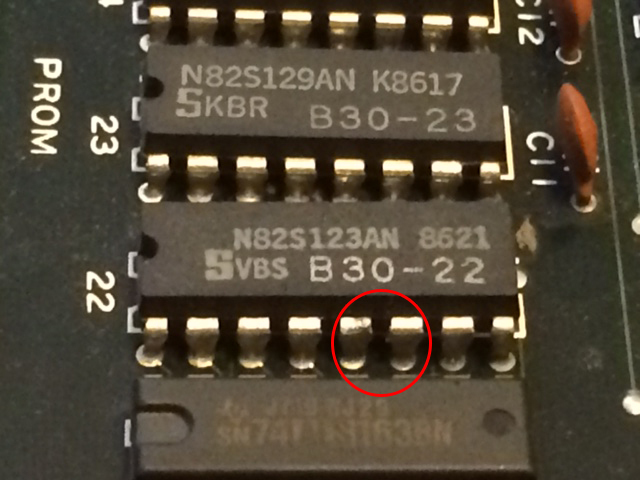 There was a small solder bridge connecting pins 5 and 6. I fired up my soldering iron and removed the bridge. I just received this board a few weeks ago and all the sprites were white blocks. Everything on the board checked out visually, and the seller was trusted and said it was working. Pressing around I found a chip with a simple cold solder joint and it was back up and running in two minutes. Lovely game.